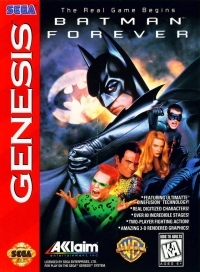 09-14-2018 josepy Box Text Brace yourself for endless action with BATMAN FOREVER! 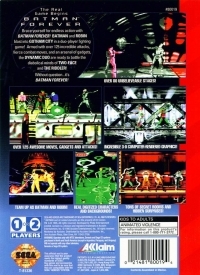 BATMAN and ROBIN blast into GOTHAM CITY in a duo-player fighting game! Armed with over 125 incredible attacks, fierce combat moves, and an arsenal of gadgets, the DYNAMIC DUO are ready to battle the diabolical minds of TWO-FACE and THE RIDDLER! Without question...it's BATMAN FOREVER!